Ted Felicetti also knows what it's like to win. As a member of the band Split Fifty, he toured professionally for ten years. He played the Warp Tour. He made his living as a musician, and played to hundreds of thousands of fans over the course of his career. He also knows what it's like to fail. To work hard and come up a little short. To spend hundreds of hours playing and testing and improving and winning, only to fall in the finals of Pro Tour Qualifier after Pro Tour Qualifier. To lose win-and-in after win-and-in at Grand Prix. But it took his experience with both to lead him to Pro Tour Guilds of Ravnica. "I should just buy a bridesmaid dress, for all the times I've lost win-and-ins for the Pro Tour," he said with a rueful laugh. "It seems like all my friends are always on the Pro Tour and I'm the one at home watching coverage playing Magic Online." He may not have liked it at the time, but all that time on Magic Online paid off earlier this year when Felicetti won the monthly Magic Online Championship Series event, qualifying him for a playoff later this season at Wizards of the Coast in Renton, Washington, as well as a Pro Tour berth a long time in the making. 24 years in the making, that is, for the leader in Magic Online Guilds of Ravnica Standard Leagues trophies. He began playing Magic in 1994—"My first pack was Fallen Empires," he said with a knowing grin—but stopped when his music career began taking off. It wasn't until 2011 that he came back to the game on a friend's suggestion. "I didn't even know Magic was still around," he admitted. "But I gave it a shot again and then I started to get more competitive and started playing a lot online." Magic Online soon turned into SCG Tour events and then Grand Prix as well. 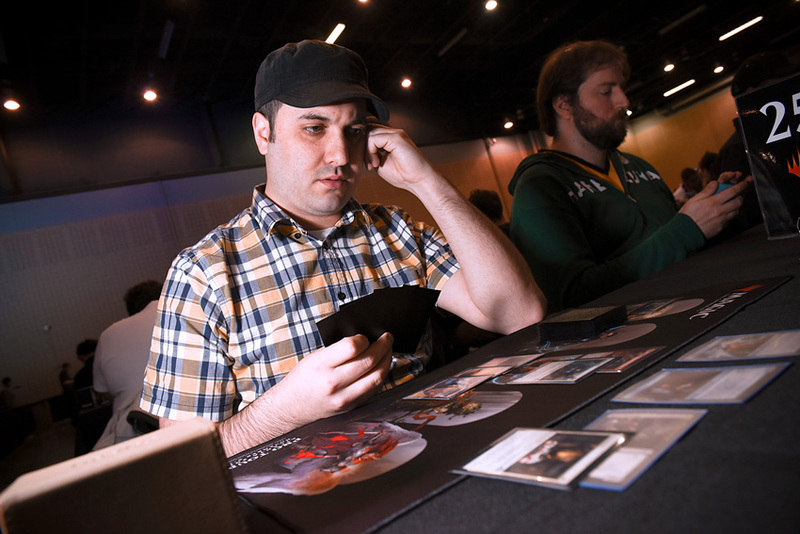 And it was clear before long that Felicetti had what it took to succeed in the game, but no matter how many deep runs or SCG Top 8 appearances he amassed, the ultimate goal of reaching the Pro Tour remained just out of reach. It's enough to make most people quit. But Felicetti isn't most people. Drawing on his experience moving up the ranks of the music world, he kept working and improving. Not only is he good-natured about the near-misses, he wouldn't trade them in for an easy path to the Pro Tour. "All those losses did is make me better," he said. "You have to earn it. I put in my time and it paid off." Felicetti put in more than time—he has been an innovator of the Guilds of Ravnica Standard format. He was one of the first to innovate the Path of Discovery explore deck in the format, and helped advance the fledgling format along with friends and testing partners Gabriel Nassif, Eli Kassis, and Shaheen Soorani, all of whom have benefitted from their time playing with Felicetti and have gone on to considerable success at the professional level. Now he's at the Pro Tour himself, locked in for Day Two and live for a shot at requalifying for the next one with an 11-5 finish. And while he may appreciate the lessons the losses have taught him, he's ready to start winning. "I'm happy I'm here and I want to come back," he said simply. "It's up to me now."